Following several years of investment in research and development plus geographic expansion, the global private equity company, Advent International, has made this expected transition. The Erich Wesjohann Group became a strategic partner in Aviagen in November 2003 through the sale Ross EPI to Aviagen. As part of this transaction, the Erich Wesjohann Group acquired a 21% shareholding in Aviagen with its founder and CEO, Erich Wesjohann, joining the Aviagen board. Aviagen and the Erich Wesjohann Group holding leading positions in their respective markets. Aviagen brands include Ross, Nicholas Turkey, Arbor Acres, L.I.R. and C.W.T. The Erich Wesjohann Group subsidiaries are Hy-Line, Lohmann Tierzucht and H&N International. Advent International acquired Aviagen in May 2003 in a secondary buyout from BC Partners. During its ownership, Advent has supported the company in making three significant acquisitions with the purchases of Benelux based distributor Ross EPI, central European distributor Babolna Breeding Farms, and the US facilities and operations of turkey breeder BUTA. Aviagen broiler breeders supply day-old grandparent and parent stock chicks to customers in more than 100 countries worldwide under the Arbor Acres®, Indian River®, and Ross® brand names. Aviagen also offers specialty breeding stock aimed to give customers flexibility in their product choice and meet specific market requirements. The Rowan Range® brand of specialty birds, with variable coloring depending on male choice, is available in select regions and meets the needs of selected niche or emerging markets, including the slower-growing, free-range, and organic segments. The Specialty Male® portfolio is a line of males aimed to meet the needs of customers who are looking for specific performance traits in their broiler breeding stock, including high breast meat yield, adaptability to environments where elevated temperatures prevail or live production attributes such as FCR and hatch. Headquartered in Germany, the Erich Wesjohann Group with its subsidiaries Hy-Line International, Lohmann Tierzucht and H&N is the global market leader in the breeding of egg layer genetics. With a number of wholly owned operations and joint ventures across the world, the group serves the world's egg industry in more then 100 countries. 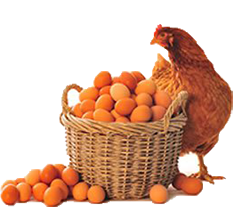 Besides the core business of egg layer breeding, the Erich Wesjohann Group is internationally active in the fields of animal health, functional food ingredients, grain storage, mushroom integration, and SPF egg production. The Erich Wesjohann group employs about 2,000 people world wide. Aviagen is one of the world's leading poultry science companies, developing pedigree lines for the production of broiler chickens and turkeys principally under the Ross, Nicholas Turkey, Arbor Acres, L.I.R. and C.W.T. brand names. The company is based near Edinburgh, UK and in Huntsville, Alabama, USA with a number of wholly owned operations across Europe and USA and joint ventures in Western and Central Europe, Latin America, South Africa and Asia. Aviagen employs 1,300 people and has a distribution network serving 250 customers in 85 countries. Affordable and higher quality food will result from new genetic advances inspired by a unique industry collaboration. Two of the world’s largest animal breeding companies aim to achieve further breakthroughs in the field of genomics during the next three years of a joint development agreement (JDA). Arkansas-based Cobb-Vantress Inc. and Hendrix Genetics B.V. which is headquartered in Boxmeer in the Netherlands initially set up the JDA in 2008 to share and promote expertise, particularly in the fast-growing field of genomics. The JDA will also strengthen Cobb’s leading position in broiler breeding and Hendrix Genetics’ renowned role in layer hen, turkey, pig and aquaculture genetics, while enabling the two companies to further explore joint venture business opportunities. Cobb-Vantress, is also (!?) the world’s leading supplier of broiler breeding stock and technical expertise for the chicken meat industry. The company, the oldest in poultry breeding industry, is based in the USA in Siloam Springs, Arkansas. Successful products are distributed to the market and to customers through either direct Cobb-Vantress commercial operations or through the company's partnerships with over 50 distributors worldwide. Cobb-Vantress is formed as a joint venture between Tyson Foods, Inc. and The Upjohn —Company, and positions Cobb as an international leader in poultry breeding. The company moves from Concord, Massachusetts, to Siloam Springs, Arkansas. New research complex is developed in Jane, Missouri. A portfolio of products caters to different market requirements: The COBB500™ is the product of more than 30 years’ research and development. It is the standard for many producers, with a reputation for uniformity and ability to thrive on lower cost nutrition. The COBB700™ has increased emphasis on breast meat yield for deboned and further processed, value added products. COBBAVIAN48™ is targeted at customers seeking a responsive breeder and broiler combination and competitive chick cost required in many markets worldwide. Cobb serves the world’s broiler industry in more than 90 countries with about 2,500 employees. Hendrix Genetics, headquartered in Boxmeer, the Netherlands-EU, is a leading multispecies breeding company with 5 primary activities: layer breeding (Institut de Sélection Animale-ISA,), pig breeding (HYPOR), turkey breeding (HYBRID), aquaculture breeding (LANDCATCH) and poultry distribution (GRELIER, GRELAVI, GRELEGER, STVO ,ALS, SFPA, INTEGRA, JOICE & HILL). The company is dedicated to generating solutions for the animal protein sector that solve the challenges of today and tomorrow. Backed by a strong portfolio of leading brands, Hendrix Genetics provides expertise and resources to producers in more than 100 countries, with operations in 24 countries and more than 2.400 employees worldwide. Hypeco and CPI may have left the business, the Bovans breed is still available in the Hendrix Genetics portfolio. The founder of Bovans was Harry van Duijnhoven, together with his wife Nora. The Bovans breeding center was at Harry van Duijnhoven’s farm at Stevensbeek. Started in 1954, the Bovans layer reflected the solid, hardworking ethics of four Dutch families, Bongers, Van Duijnhoven, Van Lankveld and Van der Linden started Bovans Poultry Breeders in 1954. One “Bo” and three “Vans” formed the name Bovans. The founders worked together in their family barn to breed a strong, healthy laying hen, and the original Bovans logo, still in use today, was designed by Harry van Duijnhoven’s brother. Bovans Poultry Breeders soon developed into a strong and successful breeder. Sixty years later, the Bovans bird is now found in barns all over Europe, the Americas, Africa, and the Middle East. The strong consolidation of the layer breeding companies in the last decade, has limited the choice of breeds for the egg industry. Novogen offers a new alternative giving the egg producers more choice and possibilities to fit their specific market requirements. Novogen concentrates all efforts on its core business, research and development of products that suit the specific market needs. Novogen supplies layer Grand Parent Stock and Parent stock to the independent players in the egg industry. The Novogen products are now present on each continent in a total of more than 50 countries. Novogen is a sister company of Hubbard AND Grimaud Freres, who are all part of Groupe Grimaud. Novogen is supported by a global network of sales, marketing and logistics. And the expertise and experience of the international technical specialists of one of the major multi-species animal breeding companies in the world assures that all customers are well supported, from the breeding technology to the technical follow up of the products in the field. Hubbard is also a company of Groupe Grimaud. From the small flock of chickens with which Ira and Oliver Hubbard began the business in 1921, Hubbard has grown to one of the major international broiler breeding companies in the world. Oliver Hubbard’s graduation from the New Hampshire Agriculture College in 1921 can been seen as the beginning of Hubbard in the commercial poultry business. From 1921 up to the acquisition by Merck in 1974, Hubbard has always been a family company. In 1997 Hubbard merged with the ISA-group from France, purely focusing on broiler breeding as from 2003. Since the French company Groupe Grimaud took over Hubbard from Merial in 2005 Hubbard is again part of a family company, which is the 2nd largest multi-species animal breeding company in the world, with a clear focus on the further development of Hubbard’s business in the broiler industry around the world. Hubbard provides solutions that focus on the economic performance, health and well-being of breeding stock. Hubbard specializes in state-of-the-art selection programs to improve the performance of their pure lines. It is essential to Hubbard to preserve a large gene pool offering more flexibility for innovative solutions to an industry facing more and more constraints being imposed to them: increased feed prices, animal welfare regulations, increased segmentation of the markets, and in some countries a reduction/shortage in production surface. Hubbard operates its selection programs in 3 different R&D centres in North America and Europe, along with its own production sites in North America, Europe and Brazil. Hubbard has a longstanding experience in breeding, developing and marketing breeding stock for both conventional and alternative markets. Presence in nearly 100 countries around the world and the support of dedicated teams involved in R&D, Production, Technical Service and Sales & Marketing assure the continuity to deliver quality products that are best suited to the different broiler markets throughout the world. Aviagen has signed an agreement to purchase Hubbard Breeders, the broiler genetics division of Groupe Grimaud. The agreement between the 2 companies was signed on 31 July 2017 and will be concluded later this year. As part of the agreement, Hubbard will operate as a wholly owned subsidiary of Aviagen Group, under the direction of Aviagen CEO Jan Henriksen. It will remain an independent broiler breeding company with separate breeding and commercial activities, and will continue to be headquartered in France.